The Special Belt is a trapezoidal toothed drive belt for automatic variators with high technological content from Malossi, Italy. The dimensions are: 16x8x832mm. Thanks to its high experience on the roads of whole Europe with automatic scooters, in collaboration with specialized companies of this field, Malossi s.r.l. created a complete line of toothed belts for your scooters. As they are made of a special mixture with a very high resistance and a very low wear, the Special Belts were created to assure the maximum long-life of the product for many kilometers under safe conditions. 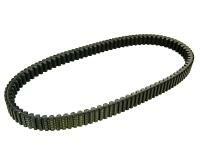 This drive belt is fully compatible with the original and guarantees maximum reliability and wear.